To use LR/TreeExporter you need to export some images. Go to the Library mode, select the images that you wish to export and then press the Export button. The LR/TreeExporter plugin will analyse the folder hierarchy of all the images that you wish to export and determine the deepest folder that contains all the selected images. 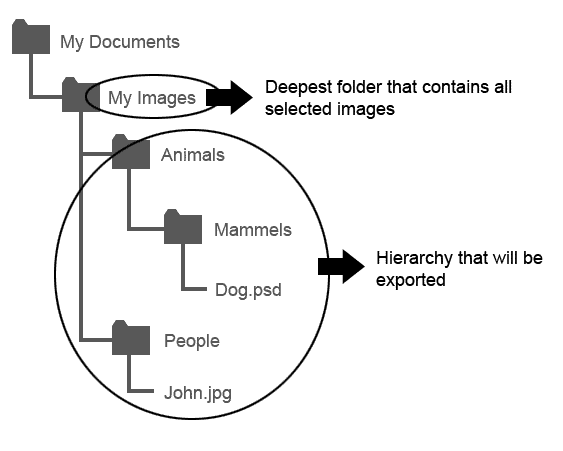 By default, it is the folder hierarchy underneath this folder that will be exported to your destination folder, however you may also choose to recreate the hierarchy from a higher point if you desire. The settings should be self explanatory, however to help visualise the effect of your settings the plugin constantly displays a couple of real examples that explain where certain images are going to be exported to. 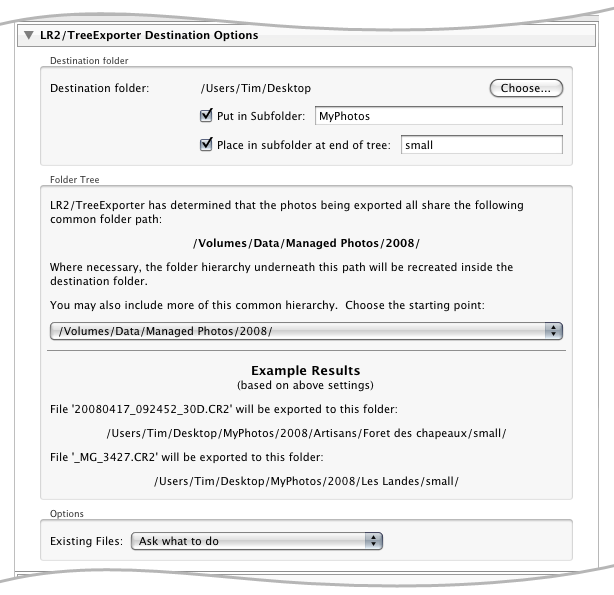 Note that LR/TreeExporter has the ability to add subfolder at both start and end of the folder tree. The subfolder at the start is just a convenience feature similar to that found in the standard "Export Files To Disk" export. You'll still need to export twice, once for large and once for small, but the files will be exported to the right place without the need for manual intervention.